Known as Beer Town USA, Bend is home to multiple breweries with flavors and brews unique to the Pacific Northwest. As such, it’s not surprising that they have a special Bend Ale Trail set up for those beer fanatics that want to visit them all! There are a few different ways you can plan your trip across the Bend Ale Trail map. Whether you want to eat and drink your way through Bend’s famous breweries or simply get your hands on the prize at the end, there’s no wrong way to go about it. There’s even something special in store for those who pledge the responsibility of being the designated driver. The bottom line is that there’s fun to be had by everyone on the Bend Ale Trail! What is the Bend Ale Trail? Where To Pick Up Your Bend Ale Trail Passport? Remember: Do the Bend Ale Trail Responsibly! What is involved with the Bend Ale Trail, and how do you complete it? We are here to answer any questions you may have about Bend’s unique pub crawl. It starts with a passport, which includes a list of all of the breweries and pubs on the trail. Fill up your passport with stamps from the participating locations in order to win unique prizes and sample some of the Northwest’s finest brews. 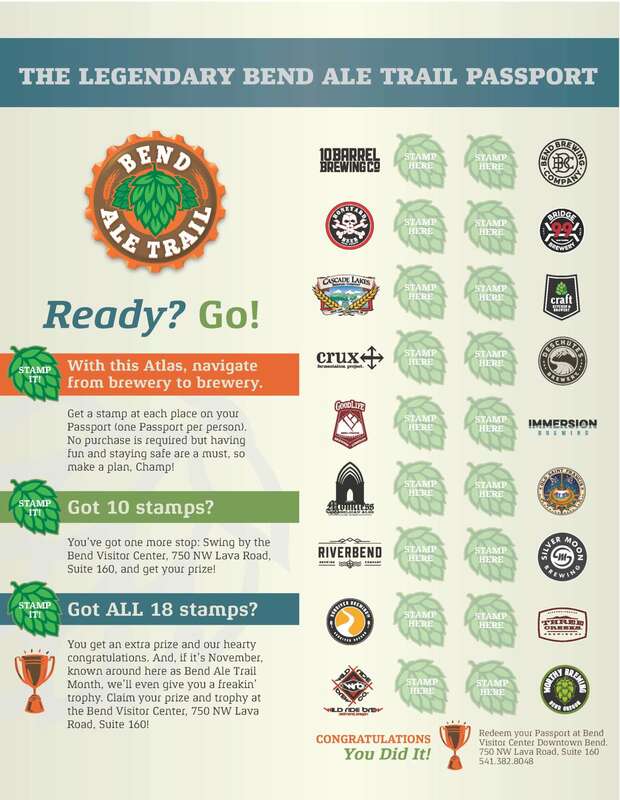 There is a total of 18 stops included on the Bend Ale Trail, but you only need to get stamps from 10 breweries to receive your commemorative Bend Silipint. Feeling bold enough to visit all 18? You’ll also get a Bend Ale Trail bottle opener. In order to received your prize(s), you will need to stop by or send in your completed Bend Ale Trail passport to the Bend Visitor Center downtown (750 NW Lava Road, Suite 160). Be sure to do your research before planning your pub crawl. Not all of the brewery locations are open 7 days a week, and they must be open for you to receive a stamp and get credit for your stop on the Bend Ale Trail. However, even though they have to be open it’s important to note that you are not obligated to make a purchase in order to get your stamp. This can help you to do the trail responsibly and visit more pubs than would be possible if you were drinking at each one. You can complete the Bend Ale Trail at any time during the year, but if you want to make the most of your experience, plan for November. There are extra prizes available and beer inspired events happening around town in addition to the Bend Ale Trail that’s available year round. Picking up your passport is easy. Simply stop by one of the participating locations, the Bend Visitor Center, the ticket mill at the Old Mill district, or any Central Oregon brochure rack to find a blank passport. You can even go to Visit Bend online and print a copy. Here is a complete list of all 18 breweries on the Bend Ale Trail, including recommended beers to try if you decide to make a purchase at your stop. 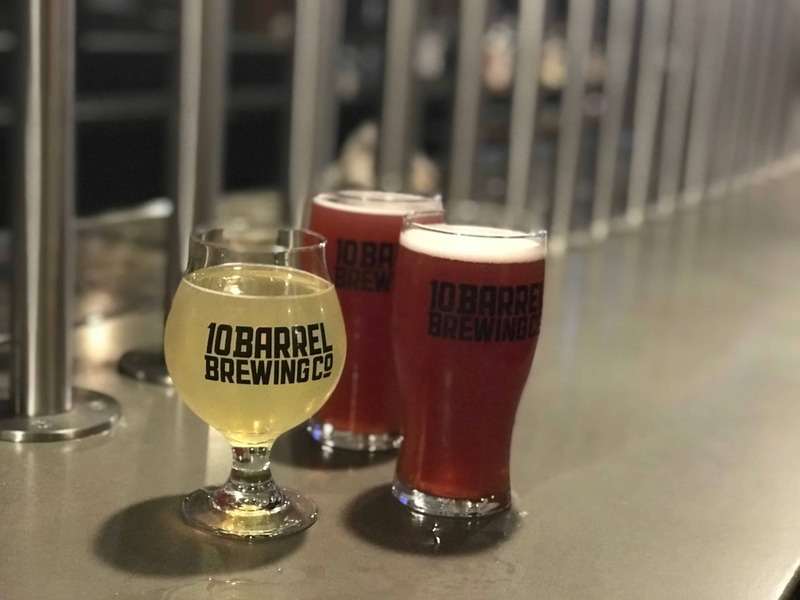 A local brewery that started in 2006 on NW Galveston Avenue in Bend, 10 Barrel Brewing Co. has expanded beyond its original location to open 6 pubs in the nation, including Portland, Denver, Boise, and San Diego. During your Bend Ale Trail pub crawl, you will definitely want to grab their signature Apocalypse IPA, and Indian Pale Ale with a Northwest twist. If IPA isn’t your preference, their fruit crush beers are also great; be sure to try the black currant blend. Started in 2010 in an old auto shop, Boneyard Beer is named for its origins. being built up from a variety of old equipment collected from 13 breweries around the country, it began as a type of boneyard itself. Fast forward to today, they have brewed 17 different beers, including the RPM IPA, a must-try on your trip across the Bend Ale Trail. One of Central Oregon’s oldest breweries, Cascade Lakes Brewing Company was started by three brothers in 1994 in Redmond, Oregon. In just six short years, they were purchased by two Central Oregon locals and now have four local pubs, including the Cascade Lakes Lodge in Bend. They brew six beers year round and have a variety of seasonals throughout the year. Be sure to time your trip around the Bend Ale Trail according to the beers you want to try during your visit. The Crux Fermentation Project opened its garage doors in 2012, with the bulk of its brewing equipment coming from a defunct Japanese brewpub. Founders Larry and Paul have spent these years building their business and furnishing their brewery with reclaimed or recycled items as a way to pay homage to the building’s history. They currently have 13 beers on tap and on store shelves, including their up and coming [BANISHED] series. Their Tough Love brew from the series – a barrel-aged imperial stout with notes of vanilla and hints of dried cherries – comes highly recommended for this Bend Ale Trail stop. GoodLife Brewing was created as a tribute to the “good life” Bend locals live in their wonderful hometown. Their signature beers are known for being well-balanced, made with imported hops, quality malts, and pristine Central Oregon Water. It would be foolish to visit the GoodLife on the Bend Ale Trail and not try their award-winning Descender IPA, a signature Northwest Indian Pale Ale with subtle tropical and peach notes. Named the 2018 Brewery of the Year, Monkless Belgian Ales is known for their strong ales with a strong tradition. Though the founder, Todd Clement, is no monk, he has dedicated his career to the study of brewing with his background as a PhD in Organic Chemistry. Our recommendation for this stop on the Bend Ale Trail? The Peppercorn Imperial Wit, with its big yet light-bodied flavor. You get the freshness of citrus with a slightly peppery finish for a unique experience you won’t find anywhere else. More than just a brewery, Riverbend Brewing Company opened its pub doors in 2013 and has been serving delicious food alongside their signature brews ever since. This location is even family friendly until 11 pm every day with an outdoor patio seating area complete with a corn hole game. They have seven beers offered year round with others available seasonally. Our recommendation is a toss-up between the Oregonized Love IPA, with its complex array of citrus, pine, and spicy hops, or their American style red/amber ale Boxcar Rapids. The Sunriver Brewing Company won the Small brewing Company Brewer of the Year in 2017. Though they started in Sunriver, they do have a location on NW Galveston in Bend, which is part of the Bend Ale Trail. As far as their year round offerings go, you’ve got to give the Vicious Mosquito IPA a try. However, if you can get your hands on a bottle of their specialty chocolate milk stout Cocoa Cow, do it! While this stop on the Bend Ale Trail is a bit out of the way – located about an hour outside of Bend – Wild Ride Brewing is definitely worth the visit if you are trekking the trail in search of some local flavors. What’s better than a peanut butter cup? How about a liquid peanut butter cup in beer form? The Nut Crusher Peanut Butter Porter is something you can’t miss if Wild Ride is one of your Bend Ale Trail stops. The Bend brewing Company is the second oldest brewery in Bend having opened in 1995. Not only do they brew uniquely flavorful brews right on the Deschutes River but they also serve deliciously beautiful food at their brewpub. You will need to check in and see what they currently have on tap as it changes regularly. If you happen to see Ching Ching, their Berliner Weisse, while you are traveling the Bend Ale Trail, grab a pint. It is their most popular and highly rated brew. The founders of Bridge 99 Brewery, Trever and Rod, found a way to follow their passion of bringing small batch brews to Bend – made by eco-friendly methods with fresh local ingredients – and they made it a reality. They have nearly 20 brews to their name, and you can’t really go wrong with trying any of them during your visit on the Bend Ale Trail. You know they are made with the finest quality ingredients to bring out the unique, smooth flavors. Everything at Craft Kitchen & Brewery, from their brews to their dishes, is made with the finest quality ingredients sourced locally in the Pacific Northwest. They believe in sustaining the earth while they satisfy your palate, using only cans and bottles 0 which are recycled – and plant-based boxes and utensils. The beers they have on tap change regularly, but we recommend the Craft Brewery 9th Plague with its layers of chocolate, coffee, and licorice. There are very few breweries you will find that have as many positive reviews on beer rating sites like Beer Advocate (BA) as Deschutes Brewery does. Thousands of users can’t be wrong when they recommend beers from this brewery, making it a must-try stop on the Bend Ale Trail. Family owned and operated, Immersion Brewing believes that people com first as they strive to create just the right experience for you. They aim to please the palate of both the beer novice and connoisseur, so there is something for everyone here. They have quite a variety of brews, including reds, stouts, IPAs, and saisons. You are sure to find something to your liking during your visit on the Bend Ale Trail. Located at the Old St. Francis school, which also houses a theater and hotel, their brewery and pub are a must-see on the Bend Ale Trail. Set in an old Catholic school, the history of the building has been reserved, even featuring old photos and original artwork from the school days. They are open every day for breakfast, lunch, and dinner. They also keep several signature beers on tap and keep the bakery cases stocked with fresh breads, pastries, cookies, and desserts daily. One of the original breweries in Bend alongside Deschutes and Bend Brewing Co., Silver Moon opened its doors in 2000. It started as a quirky little taproom and quickly expanded in 2015 to a 30BBL system in a 15,000 ft2 facility. They have been recently renovated since 2017 in order to create a wonderful brewpub experience for those traveling the Bend Ale Trail as well as regular visitors. Another brewery off the beaten path from the Bend Ale Trail is Three Creeks Brewing in Sisters. It is well worth the stop as you will be greeted with a small town feel and a smile that will make you feel like family. Beer isn’t the only thing they know how to do right. You may want to also plan on having a meal at the pub as their food is wholesome and delicious. The final stop on the Bend Ale Trail passport is Worthy Brewing Company. You will find more than just a brewery and pub here; it is also the only combination brewery and observatory (Hopservatory) in existence. You will definitely want to check out their observatory dome with retractable roof and 16-inch telescope during your visit. All of their beer is hand crafted by local brewers; you can even see them hard at work through the window on the south side of the pub during your visit. There are too many signature brews “worthy” of mention that you may just need to try a few during your visit on the Bend Ale Trail. Though you aren’t required to make a purchase in order to stamp your passport, it is understandable if you want to try all of the local brews that the Bend Ale Trail has to offer. However, you need to be sure you do so responsibly. Let’s face it, no one wants to be the designated driver, even though we all know it is the responsible and safe thing to do. Well, the organizers of the Bend Ale Trail knew this and planned accordingly to make it fun to be a designated driver too. You can still get your passport stamps since no purchase is required, but you will receive special “Designated Driver” stamps at each stop. Once you collect at least 10 stamps, you get a special prize: a Hydro Flask True Pint. Just keep in mind that you must ONLY have DD stamps in order to qualify for this special prize. There are other responsible options available if you don’t have a designated driver. Starting in downtown Bend will give you access to more than two-thirds of the pubs on the list (you still need to practice caution if walking intoxicated). There are also public transportation options set up specifically for the Bend Ale Trail including buses and towncars. If you are visiting Bend for the sole purpose of completing the Bend Ale Trail, you will want an ideally placed hotel accommodation so that you have easy access to every stop along the trail. With so many stops along the way – especially if you are attempting all 18 – you will also need to rest in between as it’s not recommended to do the whole trail in one day. Cruise around with The Oxford Hotel’s free bikes! TripAdvisor has named the Oxford Hotel the 2019 Traveler’s Choice when visiting Bend. It is located in downtown Bend, making it a perfect location for completing the Bend Ale Trail. If you aren’t planning to drink at every stop, you can utilize the hotel’s complimentary cruiser bikes to help you get your stamps. 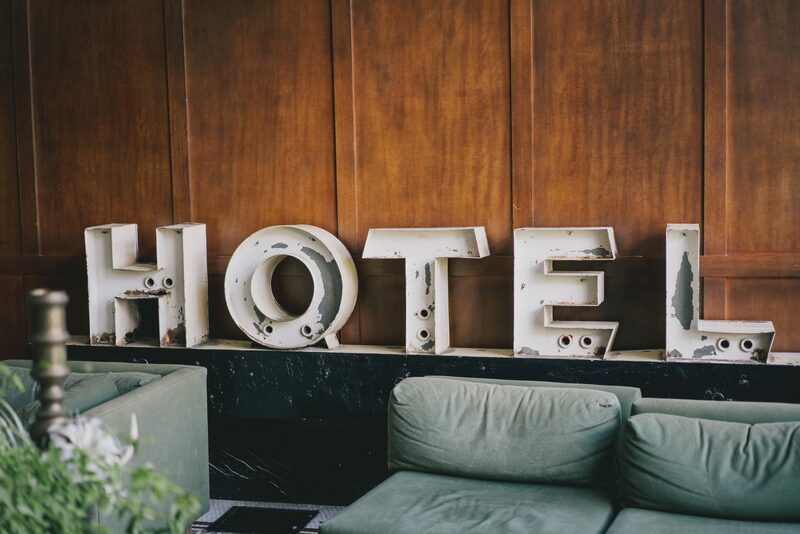 Also located right in the heart of downtown, this DoubleTree location is the perfect place to stay when you are planning your trip along the Bend Ale Trail. Not only are the accommodations as luxurious as can be expected from Hilton, you can easily walk or bike your way through the trail. Get a free beer when you check-in at the Historic Lucas House! The Historic Lucas House by Bunk+Brew gives you quite a unique lodging experience with hostel-style dorms and friendly staff. Not only is it in a great location for the Bend Ale Trail but you also get free beer at the “hotel” too. The Old Mill district is another area with some of the breweries located on the Bend Ale Trail, and Springhill Suites by Marriott in Bend is located in the Old Mill. You can enjoy a free hot breakfast in the morning and easily walk to your pub stops. 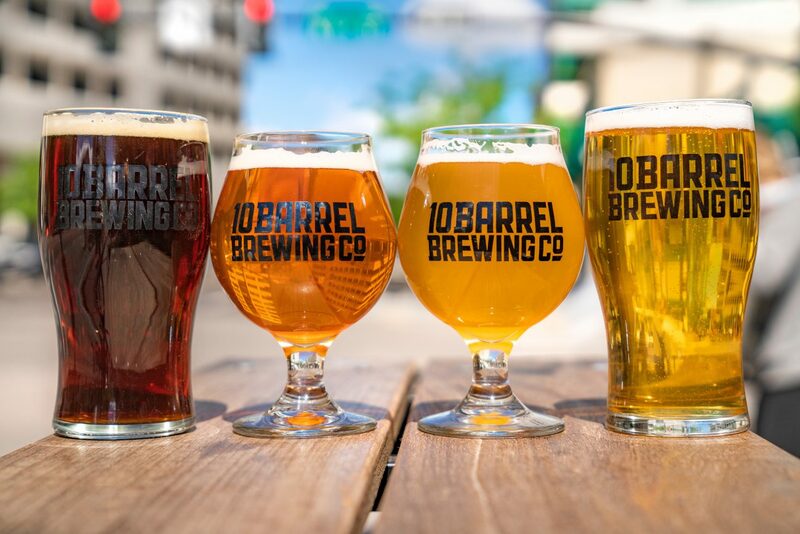 Stay at one of the Bend Ale Trail’s participating breweries. What’s better than staying on location at one of the Bend Ale Trail stops? The Old St. Francis School at McMenamins not only gives you easy access to their brewery but it gives you a unique experience staying in an old 1936 Catholic schoolhouse. An adult-only weekend of brewery samplings on the Bend Ale Trail calls for adult-only accommodations, and the Lara House Bed and Breakfast may be just what you are looking for. Only two blocks from downtown, this 1910 historic home overlooks Drake Park and the Deschutes River, giving you beautiful views as well as an ideal location. The Mill Inn Bed & Breakfast may be one of the best locations to stay when you are doing the Bend Ale Trail challenge. It is located only six blocks from downtown and within walking distance of the Old Mill district, so you will have easy access to most of your passport stops.